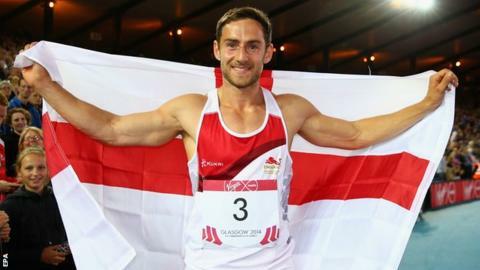 Great Britain decathlete Ashley Bryant says it was "incredibly frustrating" to find out an airline had lost his vaulting poles before a key Olympic qualification meeting. Bryant, 25, borrowed poles at last week's Hypo Meeting in Gotzis after his never arrived on a Swiss Air flight. He fell 30cm short of his personal best in the pole vault and missed the qualifying standard by just 44 points. "I'm now left chasing qualification events," he told BBC Radio 5 live. "And I have to sit down with my coach to decide where we go next." Swiss Air say they have since reunited Bryant with his poles and are working to establish what went wrong. Bryant must now try to achieve the qualifying standard of 8,100 points at the remaining meetings before the Olympics begin in August. He scored 8,056 points in Gotzis, but does have a personal best of 8,141. A British Athletics spokesman told the Guardian that Bryant's case would be looked at "as an individual case", meaning he could yet qualify. "It's an incredibly frustrating situation," he said. "We checked the plane we were going to take would take poles. We got to the airport and they said: 'These aren't going to make the flight. The next day there's a larger plane'. "But Sunday came and my poles were not there. I managed to borrow some off a Swedish athlete but they're not the same poles I've trained on. "I have different poles from the ones which are applicable to a lot of the other guys."